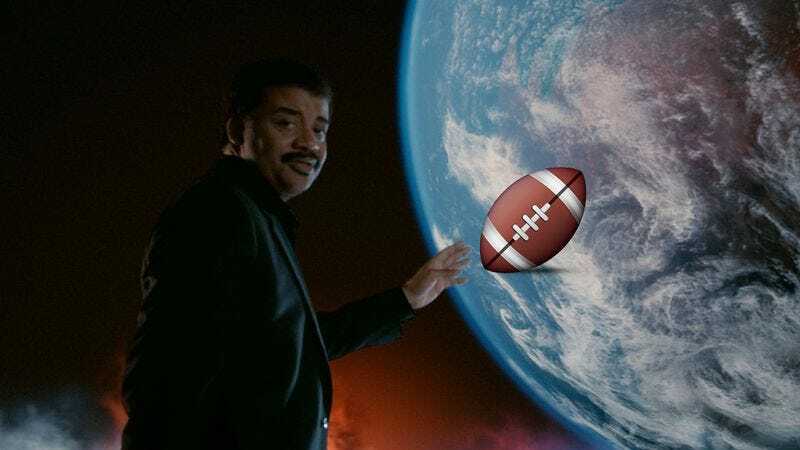 The farce of the NFL’s “Deflate-Gate” affair has become hysterical enough that prominent astrophysicist Neil DeGrasse Tyson felt the need to weigh in on Twitter, and in the space of 125 characters, Tyson managed to bungle some straightforward fundamentals of science. The sporting-goods controversy centers on the footballs used by the Patriots offense in this year’s AFC Championship Game, which were tested by officials at halftime and were reportedly found to be as much as two pounds per square inch under the NFL specification of 12.5-13.5 PSI. The league is investigating whether the Patriots tampered with their footballs. On Saturday, New England Patriots head coach Bill Belichick held a press conference in which he said that there was no tampering. To explain the PSI drop, he said that the team had conducted experiments and determined that temperature, rain, and other variables can account for swings in a ball’s internal pressure after it is inflated. Tyson is having none of it: “For the Patriots to blame a change in temperature for 15% lower-pressures, requires balls to be inflated with 125-degree air,” he tweeted. The only problem with this hot science take is that Tyson’s numbers, and therefore his conclusions, are nonsense. Since Tyson is a noted debunker himself, he likely will not mind The A.V. Club helping him out a little. Tyson’s error is to confuse gauge pressure with absolute pressure. The PSI figures at the heart of this mess are measurements of gauge pressure, meaning that they were read from a gauge that indicates pressure relative to the surrounding atmospheric pressure—much the same way that the Celsius scale indicates temperature relative to the freezing point of water. To do his math, Tyson appears to have divided the reported 2-PSI drop by about 13 PSI (the midrange of the NFL’s 12.5- to 13.5-PSI specification) and concluded that there was a 15 percent drop in pressure. This is like comparing a 20° C afternoon to a 0° C afternoon and concluding that 100 percent of the heat was lost in between. Just as you must first convert temperatures to an absolute scale like Kelvin before you can make that sort of percentage-based comparison, you must likewise convert gauge pressure to absolute pressure. The conversion isn’t hard: You just add atmospheric pressure to gauge pressure, and you get the absolute pressure. The atmospheric pressure at sea level is approximately 14.7 PSI. So in absolute terms, the internal pressure Patriots’ footballs theoretically declined from 27.2 PSI to 25.2 PSI—a drop of about 7 percent. In a widely circulated blog post, an amateur scientist who goes only by “Hondo” determined over the weekend that if the pressure difference were explained exclusively by a temperature drop, the starting temperature would have to be about 87° F. (Hondo also initially used gauge pressure instead of absolute pressure but later corrected what he called a “rookie mistake.”) This Hondo guy may not have the name recognition of Tyson, but at least he uses the right numbers, declares his units, and shows his work. An athletic testing lab in Pittsburgh, HeadSmart Labs, did just that. HeadSmart’s researchers inflated footballs to 12.5 PSI in a 75° F setting, and then to simulate the conditions at the cool, rainy AFC Championship Game, they brought the balls to a 50° F setting and got them wet. HeadSmart found that the pressure in the balls declined an average of 1.8 PSI, which is remarkably close to the numbers bandied about in media reports of the Patriots’ footballs (which, to be clear, doesn’t necessarily exonerate New England). But this only matters if you believe that experimentation, rather than half-assed tweeting, is the foundation of scientific inquiry. It should be noted that my Patriots fandom is well-documented (as is my Tyson fandom), and that bias colors my reading of this news. It also tells you why I care so much about this entire shitshow. But Tyson’s screwup is a basic one, and it’s not difficult to verify. The problem here is not that Tyson slandered the Patriots; the problem is that Deflate-gate has metastasized to such an extent that even a world-class scientist has been infected by the dumb. I neglected to account for the fact that the football pressures were “gauge” pressures (as would be the pressures measured in any ball on Earth) rather than “absolute” pressures. And the calculation that I performed applies only to absolute pressures—which reference the case where the football pressure is measured in the vacuum of space, without the effects of atmospheric pressure on the measurement. Using the (correct) gauge pressure in the calculation reduces the needed inflation temperature to about 90-degrees [Fahrenheit] for that effect.